ANCIENT GREASE were a Welsh band who were formed from the ashes of STRAWBERRY DUST in the spring of 1970. The brainchild of writer John Weathers the band had MORTY on vocals and GRAHAM WILLIAMS on lead guitar, both of whom found fame and fortune as singer and lead guitarist respectively with Welsh rockers RACING CARS later that decade. This album originally released in July 1970 is now released for the first time on CD. Listed in Record Collectors 2008 Rare Record Guide the album has been lovingly remastered. A short lived project, this is not the squalling effort of clueless stoners you may think but the work of pedigree members of Wales's music 'Tafia', the core being future Racing Cars covers act Strawberry Dust (renamed hardly for the better by Lou Reizner of Mercury Records). Penned largely by future Man drummer John Weathers, replete with the distinctive rasp of Graham 'Morty' Mortimer, it's a sub-Free period turn in meaty hard blues guitar-snarling rock from opener 'Freedom Train' to the concluding title track (with churning Hammond courtesy of Man's Phil Ryan) counterpointed by well-conceived melodies and even a singalong moment in the Lindisfarne-like 'Mystic Mountain'. 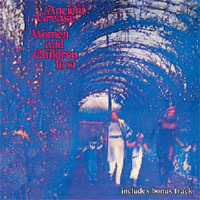 With powerful groove and charm in spades, 'Women and Children First', both the track and the album, come as buried treasure timely discovered for all to relish. It's a heady mixture of pub rock, hard-rocking R&B, blues, psychedelia, and San Francisco prog rock, with nods to the British hard rock scene along the way. This 60s West Coast Americana influenced album is decent enough rock and roll/psych fare with definite reminders of Welsh counterparts Man in the sound. A great example of what was happening in the UK heavy rock scene of 1970. If you've even half an interest in good raunchy rock mixed with a healthy dose of hippy stylings it's worth checking out.